According to the International Monetary Fund (IMF), Iran has the world’s highest rate of brain drain. Every year, more than 150,000 highly educated Iranians leave their country. The majority emigrate to the U.S., Europe, Canada, and Australia. The damage caused by this phenomenon is estimated to be $40 billion a year. The rates of Iran’s brain drain are reaching such astronomical figures that the Iranian press is beginning to suspect that a conspiracy is involved, schemed and carried out by the West with the help of Iran’s neighbors. This was indicated recently in an article published by Tabnak, which is Iran’s most popular online news agency. Its owner, Mohsen Rezai, has close connections to government officials such as Ayatollah Rafsanjani, and senior officers within Iran’s Islamic Revolutionary Guards Corps (IRGC). One event which has strengthened this conspiracy theory is the defection of Ali Reza Asgari, a top IRGC general, in March 2007. According to Western media reports, he was lured away by the promise of millions of dollars and a better future. His defection is believed to have caused considerable damage to Iran’s intelligence network and nuclear program. Another is a CIA-engineered nuclear brain drain from Iran, which was carried out in 2005 with limited success. Some pro-government elements in Iran now suspect that the West wants to weaken Iran’s economic infrastructure to the point of collapse by luring away its top graduates and professionals. The methods applied in such cases to lure away Iran’s top talent are much less cloak and dagger, as was the case with Asgari. They include an increase in the number of issued student visas and work permits. And many of those who are moving abroad are succeeding. One only has to look at top technology companies and universities in the U.S. One successful Iranian among many is Anousheh Ansari, the first female space tourist and leading telecommunications entrepreneur. There is also Firouz Naderi, NASA director of the Mars project, as well as many others. Those blaming the West for this phenomenon may be getting carried away with their conspiracy theories. Nevertheless, the Iranian government has every reason to be concerned. One example is Iran’s airline sector. Already beset by maintenance problems due to sanctions, it now has to deal with the new phenomenon of pilot shortages. Increasing numbers of Iranian pilots are leaving their $450-a-month jobs in Iran for $7,000 monthly salaries paid by newly established Persian Gulf airlines. This phenomenon is damaging Iran’s struggling tourism and transportation sector. Other impacted sectors are Iran’s oil and gas. Iran relies on these sectors for 80% of its export receipts. Decaying infrastructure, corruption, and low wages are forcing some of Iran’s top oil engineers to look for new jobs. Increasing numbers of such engineers are finding it easier to get work abroad for higher wages and better conditions due to an increase in investment by oil-rich countries of the Persian Gulf. Perhaps one area which is worrying the Iranian government the most is Iran’s nuclear program. For years, the best and the brightest within Iran have been recruited by the Atomic Energy Organization of Iran (AEOI). Its top scientists are reported to receive Western-style salaries and benefits. More importantly, this organization has been the only sector in Iran which benefited from a brain gain by recruiting Iranian engineers and scientists from places such as the United States. With runaway inflation figures and increasing risk against the lives of such scientists, more may now be tempted to defect. Meanwhile, top graduates that the AEOI wants to recruit may now decide to look elsewhere, thus causing further damage to Iran’s nuclear ambitions. 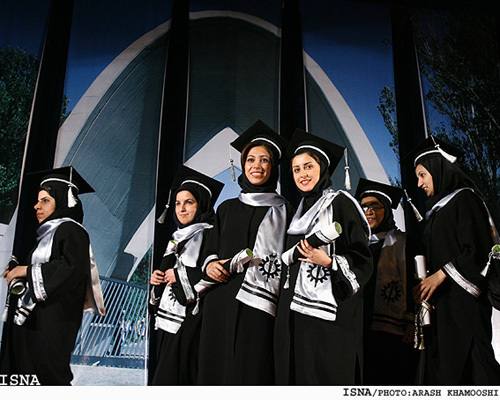 Proportionally, graduates from Tehran’s Sharif University, dubbed “Iran’s MIT,” seem to make up the largest proportion of graduates who leave the country. The parliament (Majlis) has decided to take the unprecedented step of summoning Saeed Sohrab, the head of the university, to see why so many graduates from Iran’s top university prefer to live and work abroad. This alone will not be enough to stop this damaging phenomenon. What is needed is urgent and concrete action by Iran’s leaders. The enemies of the Islamic revolution say that the country’s best brains are escaping. I don’t care that they are escaping. These university-educated people who are always concerned about Western science and civilization should be allowed to leave. We don’t want Western science and know-how. If you think that this is not your place, you are free to go. The fact that Ahmadinejad and his supporters do not want to address Iran’s brain drain problem is likely to cause more divisions within the Iranian government. This is because more moderate politicians see this phenomenon as severely damaging, and they are right. If unchecked, this phenomenon could contribute to factors which could cause the eventual downfall of the regime. A country of 70 million cannot afford to see its important economic infrastructure fall apart due to a shortage of skills. Especially not Iran, because stability is of utmost importance to its rulers. With oil prices falling and Iran needing to develop its non-oil sector, it is very likely that the extremists will be cornered. It’s either them or the economic progress of the country. One of them will have to win. For the sake of his government, Ayatollah Khamenei should make sure it is the latter.